Fig-lab presents the Millennial Monsters Series, originally uploaded by datadub. Since the dawn of this new millennium an outstanding number of Japanese Character creators have emerged whose primary medium of expression is Japanese Vinyl. The Japanese vinyl figure has a 40 year legacy which attests to its integrity and durability as an artistic medium. In our on-demand fast turnaround post-modern world, the means of production have been made available to independent artists who can now create smaller runs than demanded by the tool and die mentality of the previous century. This further evidenced by the increasing number of creators worldwide who crossing over from the mass produced milieu of the factory back to the province of the craftsmen of Japan's vinyl trade. Millennial Monsters will be a series of exclusive releases from Fig-lab of recent original Japanese vinyl figures in a signature color way. Many of the figures chosen for the series have been sculpted and painted by the artists themselves. All are self-financed labors of love. The objective of the series to highlight some of these outstanding creators, producers and their endearing characters. In addition to the releases themselves, effort will be made to showcase the the backstories of the characters, a history of the figure and an insight to the creative process of each artist. 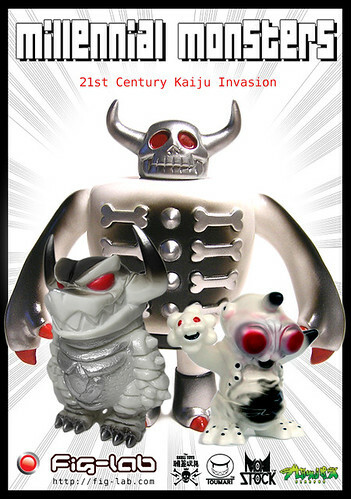 The name of the series is an unabashed homage to the book Millennial Monsters: Japanese Toys and the Global Imagination by Anne Allison, which is the most outstanding book I have ever read about post-war Japanese society and its relationship with the west through toys, characters and entertainment. The Symposium will be a 5-day session with a variety of panels and presentations. GSF2009 is graciously hosted by Onell Design and Callgrim at the San Diego Convention Center (SDCC#4937) . Don 'Datadub' Kratzer - Director of the International Figure Research Laboratory - will be giving the keynote and holding daily morning sessions on recent trends in figure culture from the far east. Afternoon sessions will feature many illustrious guest speakers and special exhibit. The final day will be an open day workshop to recap everything that was covered during the Symposium. 1. Share information about the dynamism of vinyl culture and its future: recent material developments, deformation theory and anticipated creature trends. 2. Explain the role of independently produced figures in promoting global economic growth and development and the collective accumulation impulse'S expanding contribution to the infrastructure for a global figure economy. 3. Highlight the value of the application of techno-animism and polymorphous perversity, drawing on examples from developed and developing cross-pollination projects. TOPIC: Applied Dream Projection Theory vis-a-vis Vinyl Style Evolution.